A self-replicating machine is a type of autonomous robot that is capable of reproducing itself autonomously using raw materials found in the environment, thus exhibiting self-replication in a way analogous to that found in nature. The concept of self-replicating machines has been advanced and examined by Homer Jacobsen, Edward F. Moore, Freeman Dyson, John von Neumann and in more recent times by K. Eric Drexler in his book on nanotechnology, Engines of Creation (coining the term clanking replicator for such machines) and by Robert Freitas and Ralph Merkle in their review Kinematic Self-Replicating Machines which provided the first comprehensive analysis of the entire replicator design space. The future development of such technology is an integral part of several plans involving the mining of moons and asteroid belts for ore and other materials, the creation of lunar factories, and even the construction of solar power satellites in space. The possibly misnamed von Neumann probe is one theoretical example of such a machine. Von Neumann also worked on what he called the universal constructor, a self-replicating machine that would operate in a cellular automata environment. A self-replicating machine is an artificial self-replicating system that relies on conventional large-scale technology and automation. Certain idiosyncratic terms are occasionally found in the literature. For example, the term clanking replicator was once used by Drexler to distinguish macroscale replicating systems from the microscopic nanorobots or "assemblers" that nanotechnology may make possible, but the term is informal and is rarely used by others in popular or technical discussions. Replicators have also been called "von Neumann machines" after John von Neumann, who first rigorously studied the idea. However, the term "von Neumann machine" is less specific and also refers to a completely unrelated computer architecture that von Neumann proposed and so its use is discouraged where accuracy is important. Von Neumann himself used the term universal constructor to describe such self-replicating machines. Historians of machine tools, even before the numerical control era, sometimes figuratively said that machine tools were a unique class of machines because they have the ability to "reproduce themselves" by copying all of their parts. Implicit in these discussions is that a human would direct the cutting processes (later planning and programming the machines), and would then be assembling the parts. The same is true for RepRaps, which are another class of machines sometimes mentioned in reference to such non-autonomous "self-replication". In contrast, machines that are truly autonomously self-replicating (like biological machines) are the main subject discussed here. The general concept of artificial machines capable of producing copies of themselves dates back at least several hundred years. An early reference is an anecdote regarding the philosopher René Descartes, who suggested to Queen Christina of Sweden that the human body could be regarded as a machine; she responded by pointing to a clock and ordering "see to it that it reproduces offspring." Several other variations on this anecdotal response also exist. Samuel Butler proposed in his 1872 novel Erewhon that machines were already capable of reproducing themselves but it was man who made them do so, and added that "machines which reproduce machinery do not reproduce machines after their own kind". In George Eliot's 1879 book Impressions of Theophrastus Such, a series of essays that she wrote in the character of a fictional scholar named Theophrastus, the essay "Shadows of the Coming Race" speculated about self-replicating machines, with Theophrastus asking "how do I know that they may not be ultimately made to carry, or may not in themselves evolve, conditions of self-supply, self-repair, and reproduction". In 1802 William Paley formulated the first known teleological argument depicting machines producing other machines, suggesting that the question of who originally made a watch was rendered moot if it were demonstrated that the watch was able to manufacture a copy of itself. Scientific study of self-reproducing machines was anticipated by John Bernal as early as 1929 and by mathematicians such as Stephen Kleene who began developing recursion theory in the 1930s. Much of this latter work was motivated by interest in information processing and algorithms rather than physical implementation of such a system, however. In the course of the 1950s, suggestions of several increasingly simple mechanical systems capable of self-reproduction were made—notably by Lionel Penrose. A detailed conceptual proposal for a physical non-biological self-replicating system was first put forward by mathematician John von Neumann in lectures delivered in 1948 and 1949, when he proposed a kinematic self-reproducing automaton model as a thought experiment. Von Neumann's concept of a physical self-replicating machine was dealt with only abstractly, with the hypothetical machine using a "sea" or stockroom of spare parts as its source of raw materials. The machine had a program stored on a memory tape that directed it to retrieve parts from this "sea" using a manipulator, assemble them into a duplicate of itself, and then copy the contents of its memory tape into the empty duplicate's. The machine was envisioned as consisting of as few as eight different types of components; four logic elements that send and receive stimuli and four mechanical elements used to provide a structural skeleton and mobility. While qualitatively sound, von Neumann was evidently dissatisfied with this model of a self-replicating machine due to the difficulty of analyzing it with mathematical rigor. He went on to instead develop an even more abstract model self-replicator based on cellular automata. His original kinematic concept remained obscure until it was popularized in a 1955 issue of Scientific American. In 1956 mathematician Edward F. Moore proposed the first known suggestion for a practical real-world self-replicating machine, also published in Scientific American. Moore's "artificial living plants" were proposed as machines able to use air, water and soil as sources of raw materials and to draw its energy from sunlight via a solar battery or a steam engine. He chose the seashore as an initial habitat for such machines, giving them easy access to the chemicals in seawater, and suggested that later generations of the machine could be designed to float freely on the ocean's surface as self-replicating factory barges or to be placed in barren desert terrain that was otherwise useless for industrial purposes. The self-replicators would be "harvested" for their component parts, to be used by humanity in other non-replicating machines. The next major development of the concept of self-replicating machines was a series of thought experiments proposed by physicist Freeman Dyson in his 1970 Vanuxem Lecture. He proposed three large-scale applications of machine replicators. First was to send a self-replicating system to Saturn's moon Enceladus, which in addition to producing copies of itself would also be programmed to manufacture and launch solar sail-propelled cargo spacecraft. These spacecraft would carry blocks of Enceladean ice to Mars, where they would be used to terraform the planet. His second proposal was a solar-powered factory system designed for a terrestrial desert environment, and his third was an "industrial development kit" based on this replicator that could be sold to developing countries to provide them with as much industrial capacity as desired. When Dyson revised and reprinted his lecture in 1979 he added proposals for a modified version of Moore's seagoing artificial living plants that was designed to distill and store fresh water for human use and the "Astrochicken." In 1980, inspired by a 1979 "New Directions Workshop" held at Wood's Hole, NASA conducted a joint summer study with ASEE entitled Advanced Automation for Space Missions to produce a detailed proposal for self-replicating factories to develop lunar resources without requiring additional launches or human workers on-site. The study was conducted at Santa Clara University and ran from June 23 to August 29, with the final report published in 1982. The proposed system would have been capable of exponentially increasing productive capacity and the design could be modified to build self-replicating probes to explore the galaxy. The reference design included small computer-controlled electric carts running on rails inside the factory, mobile "paving machines" that used large parabolic mirrors to focus sunlight on lunar regolith to melt and sinter it into a hard surface suitable for building on, and robotic front-end loaders for strip mining. Raw lunar regolith would be refined by a variety of techniques, primarily hydrofluoric acid leaching. Large transports with a variety of manipulator arms and tools were proposed as the constructors that would put together new factories from parts and assemblies produced by its parent. Power would be provided by a "canopy" of solar cells supported on pillars. The other machinery would be placed under the canopy. A "casting robot" would use sculpting tools and templates to make plaster molds. Plaster was selected because the molds are easy to make, can make precise parts with good surface finishes, and the plaster can be easily recycled afterward using an oven to bake the water back out. The robot would then cast most of the parts either from nonconductive molten rock (basalt) or purified metals. A carbon dioxide laser cutting and welding system was also included. A more speculative, more complex microchip fabricator was specified to produce the computer and electronic systems, but the designers also said that it might prove practical to ship the chips from Earth as if they were "vitamins." A 2004 study supported by NASA's Institute for Advanced Concepts took this idea further. Some experts are beginning to consider self-replicating machines for asteroid mining. Much of the design study was concerned with a simple, flexible chemical system for processing the ores, and the differences between the ratio of elements needed by the replicator, and the ratios available in lunar regolith. The element that most limited the growth rate was chlorine, needed to process regolith for aluminium. Chlorine is very rare in lunar regolith. In 1995, inspired by Dyson's 1970 suggestion of seeding uninhabited deserts on Earth with self-replicating machines for industrial development, Klaus Lackner and Christopher Wendt developed a more detailed outline for such a system. They proposed a colony of cooperating mobile robots 10–30 cm in size running on a grid of electrified ceramic tracks around stationary manufacturing equipment and fields of solar cells. Their proposal didn't include a complete analysis of the system's material requirements, but described a novel method for extracting the ten most common chemical elements found in raw desert topsoil (Na, Fe, Mg, Si, Ca, Ti, Al, C, O2 and H2) using a high-temperature carbothermic process. This proposal was popularized in Discover Magazine, featuring solar-powered desalination equipment used to irrigate the desert in which the system was based. They named their machines "Auxons", from the Greek word auxein which means "to grow." Early experimentation with rapid prototyping in 1997-2000 was not expressly oriented toward reproducing rapid prototyping systems themselves, but rather extended simulated "evolutionary robotics" techniques into the physical world. Later developments in rapid prototyping have given the process the ability to produce a wide variety of electronic and mechanical components, making this a rapidly developing frontier in self-replicating system research. In 1998 Chris Phoenix informally outlined a design for a hydraulically powered replicator a few cubic feet in volume that used ultraviolet light to cure soft plastic feedstock and a fluidic logic control system, but didn't address most of the details of assembly procedures, error rates, or machining tolerances. In 2005, Adrian Bowyer of the University of Bath started the RepRap Project to develop a rapid prototyping machine which would be able to manufacture some or most of its own components, making such machines cheap enough for people to buy and use in their homes. The project is releasing its designs and control programs under the GNU GPL. The RepRap approach uses fused deposition modeling to manufacture plastic components, possibly incorporating conductive pathways for circuitry. Other components, such as steel rods, nuts and bolts, motors and separate electronic components, would be supplied externally. In 2006 the project produced a basic functional prototype and in May 2008 the machine succeeded in producing all of the plastic parts required to make a 'child' machine. Some researchers have proposed a microfactory of specialized machines that support recursion—nearly all of the parts of all of the machines in the factory can be manufactured by the factory. Hod Lipson (Cornell University), "Autonomous Self-Extending Machines for Accelerating Space Exploration"
Gregory Chirikjian (Johns Hopkins University), "Architecture for Unmanned Self-Replicating Lunar Factories"
Paul Todd (Space Hardware Optimization Technology Inc.), "Robotic Lunar Ecopoiesis"
Tihamer Toth-Fejel (General Dynamics), "Modeling Kinematic Cellular Automata: An Approach to Self-Replication" The study concluded that complexity of the development was equal to that of a Pentium 4, and promoted a design based on cellular automata. In 2012, NASA researchers Metzger, Muscatello, Mueller, and Mantovani argued for a so-called "bootstrapping approach" to start self-replicating factories in space. They developed this concept on the basis of In Situ Resource Utilization (ISRU) technologies that NASA has been developing to "live off the land" on the Moon or Mars. Their modeling showed that in just 20 to 40 years this industry could become self-sufficient then grow to large size, enabling greater exploration in space as well as providing benefits back to Earth. In 2014, Thomas Kalil of the White House Office of Science and Technology Policy published on the White House blog an interview with Metzger on bootstrapping solar system civilization through self-replicating space industry. Kalil requested the public submit ideas for how "the Administration, the private sector, philanthropists, the research community, and storytellers can further these goals." Kalil connected this concept to what former NASA Chief technologist Mason Peck has dubbed "Massless Exploration", the ability to make everything in space so that you do not need to launch it from Earth. Peck has said, "...all the mass we need to explore the solar system is already in space. It's just in the wrong shape." In 2016, Metzger argued that fully self-replicating industry can be started over several decades by astronauts at a lunar outpost for a total cost (outpost plus starting the industry) of about a third of the space budgets of the International Space Station partner nations, and that this industry would solve Earth's energy and environmental problems in addition to providing massless exploration. In 2005, a team of researchers at Cornell University, including Hod Lipson, implemented a self-assembling machine. The machine is composed of a tower of four articulated cubes, known as molecubes, which can revolve about a triagonal. This enables the tower to function as a robotic arm, collecting nearby molecubes and assembling them into a copy of itself. The arm is directed by a computer program, which is contained within each molecube, analogous to how each animal cell contains an entire copy of its DNA. However, the machine cannot manufacture individual molecubes, nor do they occur naturally, so its status as a self-replicator is debatable. In 2011, a team of scientists at New York University created a structure called 'BTX' (bent triple helix) based around three double helix molecules, each made from a short strand of DNA. Treating each group of three double-helices as a code letter, they can (in principle) build up self-replicating structures that encode large quantities of information. In 2001 Jarle Breivik at University of Oslo created a system of magnetic building blocks, which in response to temperature fluctuations, spontaneously form self-replicating polymers. In 1968 Zellig Harris wrote that "the metalanguage is in the language," suggesting that self-replication is part of language. In 1977 Niklaus Wirth formalized this proposition by publishing a self-replicating deterministic context-free grammar. Adding to it probabilities, Bertrand du Castel published in 2015 a self-replicating stochastic grammar and presented a mapping of that grammar to neural networks, thereby presenting a model for a self-replicating neural circuit. Partial construction is the concept that the constructor creates a partially constructed (rather than fully formed) offspring, which is then left to complete its own construction. The von Neumann model of self-replication envisages that the mother automaton should construct all portions of daughter automatons, without exception and prior to the initiation of such daughters. Partial construction alters the construction relationship between mother and daughter automatons, such that the mother constructs but a portion of the daughter, and upon initiating this portion of the daughter, thereafter retracts from imparting further influence upon the daughter. Instead, the daughter automaton is left to complete its own development. This is to say, means exist by which automatons may develop via the mechanism of a zygote. The idea of an automated spacecraft capable of constructing copies of itself was first proposed in scientific literature in 1974 by Michael A. Arbib, but the concept had appeared earlier in science fiction such as the 1967 novel Berserker by Fred Saberhagen or the 1950 novellette trilogy The Voyage of the Space Beagle by A. E. van Vogt. The first quantitative engineering analysis of a self-replicating spacecraft was published in 1980 by Robert Freitas, in which the non-replicating Project Daedalus design was modified to include all subsystems necessary for self-replication. The design's strategy was to use the probe to deliver a "seed" factory with a mass of about 443 tons to a distant site, have the seed factory replicate many copies of itself there to increase its total manufacturing capacity, and then use the resulting automated industrial complex to construct more probes with a single seed factory on board each. A number of patents have been granted for self-replicating machine concepts. The most directly relevant include U.S. Patent 4,734,856 "Autogeneric system" Inventor: Davis; Dannie E. (Elmore, AL) (March 1988), U.S. Patent 5,659,477 "Self reproducing fundamental fabricating machines (F-Units)" Inventor: Collins; Charles M. (Burke, VA) (August 1997), U.S. Patent 5,764,518 " Self reproducing fundamental fabricating machine system" Inventor: Collins; Charles M. (Burke, VA)(June 1998); Collins' PCT: and U.S. Patent 6,510,359 "Method and system for self-replicating manufacturing stations" Inventors: Merkle; Ralph C. (Sunnyvale, CA), Parker; Eric G. (Wylie, TX), Skidmore; George D. (Plano, TX) (January 2003). Macroscopic replicators are mentioned briefly in the fourth chapter of K. Eric Drexler's 1986 book Engines of Creation. 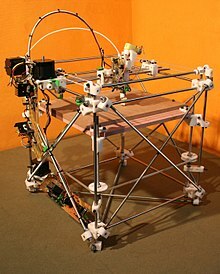 In 1995, Nick Szabo proposed a challenge to build a macroscale replicator from Lego robot kits and similar basic parts. Szabo wrote that this approach was easier than previous proposals for macroscale replicators, but successfully predicted that even this method would not lead to a macroscale replicator within ten years. In 2004, Robert Freitas and Ralph Merkle published the first comprehensive review of the field of self-replication (from which much of the material in this article is derived, with permission of the authors), in their book Kinematic Self-Replicating Machines, which includes 3000+ literature references. This book included a new molecular assembler design, a primer on the mathematics of replication, and the first comprehensive analysis of the entire replicator design space. In 2006, the strategy video game Sword of the Stars included an enemy of the Unknown Menace type called Von Neumann, which gradually replicated and spread throughout the galaxy once encountered. As the use of industrial automation has expanded over time, some factories have begun to approach a semblance of self-sufficiency that is suggestive of self-replicating machines. However, such factories are unlikely to achieve "full closure" until the cost and flexibility of automated machinery comes close to that of human labour and the manufacture of spare parts and other components locally becomes more economical than transporting them from elsewhere. As Samuel Butler has pointed out in Erewhon, replication of partially closed universal machine tool factories is already possible. Since safety is a primary goal of all legislative consideration of regulation of such development, future development efforts may be limited to systems which lack either control, matter, or energy closure. Fully capable machine replicators are most useful for developing resources in dangerous environments which are not easily reached by existing transportation systems (such as outer space). An artificial replicator can be considered to be a form of artificial life. Depending on its design, it might be subject to evolution over an extended period of time. However, with robust error correction, and the possibility of external intervention, the common science fiction scenario of robotic life run amok will remain extremely unlikely for the foreseeable future. ^ a b c Freitas, Robert A.; Ralph C. Merkle (2004). Kinematic Self-Replicating Machines. Georgetown, Texas: Landes Bioscience. ISBN 978-1-57059-690-2. ^ "3.11 Freitas Interstellar Probe Replicator (1979-1980)". Molecularassembler.com. 2005-08-01. Retrieved 2009-09-16. ^ a b Drexler, K. Eric (1986). "Engines of Abundance (Chapter 4) Clanking Replicators". Engines of Creation. ^ Colvin 1947, pp. 6–7. ^ Sipper, Moshe; James A. Reggia (August 2001). "Build Your Own Replicator". Scientific American. 285: 38–39. Several other variations on this anecdotal response also exist. ^ Robert A. Freitas Jr.; Ralph C. Merkle (2004). Kinematic Self-Replicating Machines. Landes Bioscience. p. 5. ^ Samuel Butler. "Erewhon, Chapter 24, The book Of the Machines". Nzetc.org. Retrieved 2009-09-16. ^ George Eliot. "Impressions of Theophrastus Such, Chapter 17, Shadows of the Coming Race". online-literature.com. Retrieved 2017-08-25. ^ Robert A. Freitas Jr.; Ralph C. Merkle (2004). Kinematic Self-Replicating Machines. Landes Bioscience. p. 11. ^ Paley, William (1802). "Chapter i, Section 1". Natural Theology: or Evidences of the Existence and Attributes of the Deity, Collected from the Appearances of Nature. E. Goodale. ISBN 978-0-576-29166-8. ; (12th Edition, 1809)[permanent dead link] See also: Michael Ruse, ed. (1998). Philosophy of Biology. pp. 36–40. ; Lenski, Richard (15 November 2001). "Twice as Natural". Nature. 414 (6861): 255. doi:10.1038/35104715. PMID 11713507. ^ Bernal, John Desmond (1929). "The World, the Flesh and the Devil: An Enquiry into the Future of the Three Enemies of the Rational Soul". ^ Robert A. Freitas Jr.; Ralph C. Merkle (2004). Kinematic Self-Replicating Machines. Landes Bioscience. p. 14. ^ Kemeny, John G. (April 1955). "Man Viewed as a Machine". Scientific American. 192 (4): 58–67. Bibcode:1955SciAm.192d..58K. doi:10.1038/scientificamerican0455-58. ^ Moore, Edward F. (October 1956). "Artificial Living Plants". Scientific American. 195 (4): 118–126. Bibcode:1956SciAm.195d.118M. doi:10.1038/scientificamerican1056-118. ^ "3.1 Moore Artificial Living Plants (1956)". Molecularassembler.com. Retrieved 2009-09-16. ^ Freeman J. Dyson (26 February 1970). The twenty-first century (Speech). Vanuxem Lecture. Princeton University. ^ "3.6 Dyson Terraforming Replicators (1970, 1979)". Molecularassembler.com. 2005-08-01. Retrieved 2009-09-16. ^ Dyson, Freeman J. (1979). Chapter 18: Thought Experiments. Disturbing the Universe. New York: Harper and Row. pp. 194–204. ^ Robert Freitas, William P. Gilbreath, ed. (1982). Advanced Automation for Space Missions. NASA Conference Publication CP-2255 (N83-15348). ^ Toth-Fejel, Tihamer (2004). "Modeling Kinematic Cellular Automata: An Approach to Self-Replication". NASA Institute for Advanced Concepts. ^ Lackner, Klaus S.; Christopher H. Wendt (1995). "Exponential growth of large self-replicating machine systems". Mathl. Comput. Modelling. 21 (10): 55–81. doi:10.1016/0895-7177(95)00071-9. ^ "3.15". Molecularassembler.com. 2005-08-01. Retrieved 2009-09-16. ^ Bass, Thomas (October 1995). "Robot, build thyself". Discover: 64–72. ^ "Freitas 2004, pp. 64-67". Molecularassembler.com. 2005-08-01. Retrieved 2009-09-16. ^ Christopher J. Phoenix (March 21, 1998). "Partial design for macro-scale machining self-replicator". Newsgroup: sci.nanotech. ^ "3.20". Molecularassembler.com. 2005-08-01. Retrieved 2009-09-16. ^ "WebHome". Archived from the original on 2007-01-12. Retrieved 2007-02-18. ^ James Jones. CubeSpawn. 2009. ^ Lipson, Hod; Evan Malone. "Autonomous Self-Extending Machines for Accelerating Space Exploration" (PDF). Retrieved 2007-01-04. ^ Chirikjian, Gregory S. (April 26, 2004). "An Architecture for Self-Replicating Lunar Factories" (PDF). Retrieved 2007-01-04. ^ Toth-Fejel, Tihamer; Robert Freitas; Matt Moses (April 30, 2004). "Modeling Kinematic Cellular Automata" (PDF). Retrieved 2007-01-04. ^ "3.25.4 Toth-Fejel Kinematic Cellular Automata (2003-2004)". Molecularassembler.com. Retrieved 2009-09-16. ^ Metzger, Philip; Muscatello, Anthony; Mueller, Robert; Mantovani, James (January 2013). "Affordable, Rapid Bootstrapping of the Space Industry and Solar System Civilization". Journal of Aerospace Engineering. 26 (1): 18–29. arXiv:1612.03238. doi:10.1061/(ASCE)AS.1943-5525.0000236. ^ "Bootstrapping a Solar System Civilization". The White House. 2014-10-14. Retrieved 2016-12-09. ^ "Exciting new ideas in space technology are getting short-changed by Congress". PRI.org. 2015-01-15. Retrieved 2016-12-09. ^ Metzger, Philip (August 2016). "Space Development and Space Science Together, an Historic Opportunity". Space Policy. 37 (2): 77–91. arXiv:1609.00737. doi:10.1016/j.spacepol.2016.08.004. ^ "Researchers build a robot that can reproduce". Physorg.com. 2005-05-11. Retrieved 2010-06-30. ^ "Self-Replication Process Holds Promise for Production of New Materials". Science Daily. Retrieved 2011-10-14. ^ Wang, Tong; Sha, Ruojie; Dreyfus, Rémi; Leunissen, Mirjam E.; Maass, Corinna; Pine, David J.; Chaikin, Paul M.; Seeman, Nadrian C. (2011). "Self-replication of information-bearing nanoscale patterns". Nature. 478 (7368): 225–228. Bibcode:2011Natur.478..225W. doi:10.1038/nature10500. PMC 3192504. PMID 21993758. ^ "Self-Organization of Template-Replicating Polymers and the Spontaneous Rise of Genetic Information". Entroy. Retrieved 2015-01-31. ^ Harris, Zellig (1968). Mathematical Structures of Language. New York, NY: John Wiley and Son. p. 17. ^ Wirth, Niklaus (1977). "What can we do about the unnecessary diversity of notation for syntactic definitions?". Commun. ACM. 20 (11): 822–823. doi:10.1145/359863.359883. ^ du Castel, Bertrand (2015-07-15). "Pattern activation/recognition theory of mind". Frontiers in Computational Neuroscience. 9. doi:10.3389/fncom.2015.00090. ISSN 1662-5188. PMC 4502584. PMID 26236228. ^ Buckley, William R. (2008). "Signal Crossing Solutions in von Neumann Self-replicating Cellular Automata". Automata 2008. ^ Buckley, William R. (2008). "Computational Ontogeny". Biological Theory. 3 (1): 3. doi:10.1162/biot.2008.3.1.3. ^ "3.11". Molecularassembler.com. 2005-08-01. Retrieved 2009-09-16. ^ Arbib, Michael A. (1974). Cyril Ponnamperuma, A. G. W. Cameron, ed. The Likelihood of the Evolution of Communicating Intelligences on Other Planets. Interstellar Communication: Scientific Perspectives. Boston: Houghton Mifflin Company. pp. 59–78. ^ Freitas, Robert A., Jr. (July 1980). "A Self-Reproducing Interstellar Probe". Journal of the British Interplanetary Society. 33: 251–264. Bibcode:1980JBIS...33..251F. Retrieved 2008-10-01. ^ "3.16 The Collins Patents on Reproductive Mechanics (1997-1998)". Molecularassembler.com. 2005-08-01. Retrieved 2009-09-16. ^ Szabo, Nick. "Macroscale Replicator". Archived from the original on 2006-03-07. Retrieved 2007-03-07. ^ "4.11.3 Merkle-Freitas Hydrocarbon Molecular Assembler (2000-2003)". Molecularassembler.com. 2005-08-01. Retrieved 2009-09-16. ^ "5.9 Brief Mathematical Primer on Self-Replicating Systems". Molecularassembler.com. 2005-08-01. Retrieved 2009-09-16. ^ "5.1.9 Freitas-Merkle Map of the Kinematic Replicator Design Space (2003-2004)". Molecularassembler.com. 2005-08-01. Retrieved 2009-09-16. ^ "3.7 Self-Replicating Automated Industrial Factory (1973-present)". Molecularassembler.com. 2005-08-01. Retrieved 2009-09-16. ^ "5.6 Closure Theory and Closure Engineering". Molecularassembler.com. 2005-08-01. Retrieved 2009-09-16. ^ "5.1.9.L Evolvability". Molecularassembler.com. 2005-08-01. Retrieved 2009-09-16. ^ "5.11 Replicators and Public Safety". Molecularassembler.com. Retrieved 2009-09-16. Colvin, Fred H. (1947), Sixty Years with Men and Machines, New York and London: McGraw-Hill, LCCN 47003762 . Available as a reprint from Lindsay Publications (ISBN 978-0-917914-86-7). Foreword by Ralph Flanders. Freeman Dyson expanded upon Neumann's automata theories, and advanced a biotechnology-inspired theory. See Astrochicken. Clanking replicators are also mentioned briefly in the fourth chapter of K. Eric Drexler's 1986 book Engines of Creation. Article about a proposed clanking replicator system to be used for developing Earthly deserts in the October 1995 Discover Magazine, featuring forests of solar panels that powered desalination equipment to irrigate the land. In 1995, Nick Szabo proposed a challenge to build a macroscale replicator from Lego(tm) robot kits and similar basic parts. Szabo wrote that this approach was easier than previous proposals for macroscale replicators, but successfully predicted that even this method would not lead to a macroscale replicator within ten years. In 1998, Chris Phoenix suggested a general idea for a macroscale replicator on the sci.nanotech newsgroup, operating in a pool of ultraviolet-cured liquid plastic, selectively solidifying the plastic to form solid parts. Computation could be done by fluidic logic. Power for the process could be supplied by a pressurized source of the liquid. In 2001, Peter Ward mentioned an escaped clanking replicator destroying the human race in his book Future Evolution. In 2004, General Dynamics completed a study for NASA's Institute for Advanced Concepts. It concluded that complexity of the development was equal to that of a Pentium 4, and promoted a design based on cellular automata. In 2004, Robert Freitas and Ralph Merkle published the first comprehensive review of the field of self-replication, in their book Kinematic Self-Replicating Machines, which includes 3000+ literature references. In 2015, advances in graphene and silicene suggested that it could form the basis for a neural network with densities comparable to the human brain if integrated with silicon carbide based nanoscale CPUs containing memristors. The power source might be solar or possibly radioisotope based given that new liquid based compounds can generate substantial power from radioactive decay. This page was last edited on 6 April 2019, at 16:46 (UTC).